DownWithTyranny! : THE PAKISTANIS SAW THE BUBBLEHEAD FROM TEXAS COMING A MILE AWAY-- WILL BUSH BE FORCED TO PAY BACK THE $5 BILLION HE WASTED? THE PAKISTANIS SAW THE BUBBLEHEAD FROM TEXAS COMING A MILE AWAY-- WILL BUSH BE FORCED TO PAY BACK THE $5 BILLION HE WASTED? 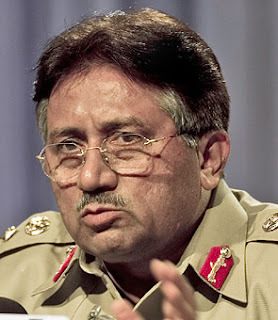 If you watched The Daily Show when John Stewart had the smooth and chatty military dictator Pervez Musharraf on as his guest, you probably got an inkling of the disdain, if not outright contempt-- in which he (Musharraf) holds Bush. He cracked up the audience by asserting that a Bush vs bin-Laden mayoral race in Karachi wouldn't leave the residents with any acceptable choices. But while Musharraf was cracking jokes at Bush's expense he was stealing billions of American taxpayer dollars from the clueless Texas clod. The Pakistanis ripped the Bush Regime every way from here to Sunday-- and then some. One diplomat told the NY Times he wondered if the Americans hadn't been taken for a ride. You think? Is this another charge-- albeit a relatively minor one-- that can be added once Pelosi puts you-know-what back on the table? Sooner or later, it all catches up with you and I can't wait to watch it catch up with Bush and the disgraceful lot of rogues who peopled his illegitimate regime.